Select Reserve disk space for deleted files to enable shadow copy on the volume where the users' shared folders are located. At least 310 MB free disk space is required. You can review or manually modify the settings directly from the properties of the users shared folder volume. For more information, please refer to the Shadow Copy section. You want to recover files that were accidentally deleted. This is the network equivalent of the Recycle Bin functionality. If you accidentally delete a file, you can open an old version of the file, and then copy it to a safe location. Shadow copies of shared folders can recover files that are deleted by any mechanism, as long as the required history folder exists. Only users in the HR department are permitted to encrypt files by using EFS. These files can be decrypted by only the user who encrypted the file, or by a special user designated as the data recovery agent You will create a new Group Policy object that contains a data recovery agent. You will restrict employees who are not in the HR department from using EFS. Computer objects for employees in the HR department are located in the HR organizational unit. Employees in the HR department use Windows XP Professional client computers. Other employees use Windows XP Professional or Windows 2000 Professional client computers. You will configure Group Policy to prevent computers that are not in the HR organizational unit from using EFS. You will then log on as various users and verify that only HR users are permitted to encrypt files. 2. Configure the HR EFS Policy Group Policy object to issue a data recovery agent. In your organization have implemented EFS. For example, if you have not implemented a formal data recovery policy but find that 80 of your users are implementing EFS, you might decide to implement recovery procedures. Although there is no way to determine if files are currently encrypted, there are registry keys that are present if EFS has ever been implemented. For example, a certificate based on the Smartcard User template can be used by a user to send secure e-mail, to perform client authentication, and to logon by using a smart card. By default, it cannot be used to authenticate a server to a client, to recover files, to encrypt files, or to perform many other tasks that rely on a certificate. Further, the certificate can be issued only to a user, not to a computer. Introduction Developing an effective data recovery plan is important when you are implementing EFS in an organization. An effective data recovery strategy will help to ensure that you can access encrypted data without the private encryption key, for example if an employee who has encrypted data leaves the organization, or when users lose their private keys. DRA function Implementing a data recovery strategy using DRAs is possible when The Cipher.exe program creates two importable files a .cer file and a .pfx file that can be used as a DRA on the local computer. The .cer file is imported to the local Group Policy object to allow it to be used as the DRA for the local computer. The .pfx file can be used for data recovery if certificates become lost or corrupted on the local computer. 7. Right-click Encrypting File System, and then click Add Data Recovery Agent. Explanation Shadow Copies of Shared Folders Shadow Copies of Shared Folders provides point-in-time copies of files that are located on shared resources such as a file server. With Shadow Copies of Shared Folders, you can view shared files and folders as they existed at a point of time in the past. Accessing previous versions of your files, or shadow copies, is useful because you can Recover files that were accidentally deleted, Recover from accidentally overwriting a file, and Compare versions of a file while working. If you do disable inheritance on a child object and later want to re-enable inheritance, you can do so from the Advanced Security Settings dialog box of the parent folder. Simply select the Replace Permission Entries On All Child Objects check box, and Windows Server 2003 will remove all explicit permissions on all child objects and replace them with inherited permissions. This is an excellent way to recover files, folders, or registry values that users have made inaccessible by removing inherited permissions. The computer retrieves the EFS recovery agent certificate for each recovery agent and extracts its public key. The public key is used to encrypt the FEK, and the encrypted FEK is put into the data recovery field (DRF) located in the file's header. This process is repeated for each EFS recovery agent. To implement EFS, a Public Key Infrastructure must be in place and at least one administrator must have an EFS Data Recovery certificate so the file can be decrypted if anything happens to the original author. The author of the file must have an EFS certificate. The files and folders to be encrypted must be stored on the version of NTFS included with Windows 2000. You can use shadow copies to view and restore shared files and folders as they existed at previous points in time. Rsucverfiles ttiai were accidentally delated Recover files lh,T were accidentally overwritten A low version-checking while working on documents Is enabled on a per volume basis, not on specific shares I s not a repi acem a h t fa r re-g lH a r bac kups Recover files that were accidentally deleted. Recover files that were accidentally overwritten. 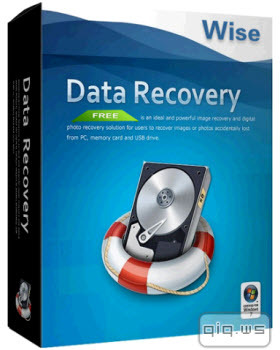 Helps recover files for users Recover files that were accidentally deleted. If you accidentally delete a file, you can open a previous version and copy it to a safe location. Recover files that were accidentally overwritten. If you accidentally overwrite a file, you can recover a previous version of the file. At 1 00 P.M. on Tuesday, a user in the Finance Department contacts you to let you know that he accidentally deleted some files from the Finance folder. You are confident that the backup procedure you established will help you recover the deleted files. However, you also want to ensure that you don't roll back any files that had been changed today, after the overnight backup job was executed. Recovering from disasters isn't limited to being able to restart the server or restore deleted files. Anyone who's ever had hard disks fail and lost important data can testify to the importance of a computer's capability to recover from hardware failure. Similarly, if a server becomes unavailable due to a major problem, network users are unable to access resources. To deal with the possibility of hardware failure,Windows Server 2003 natively supports different methods of recovery, including the use of fault-tolerant disks and server clustering. If you want to disable EFS for a domain, organizational unit, or stand-alone computer, you can do it by simply applying an empty Encrypted Data Recovery Agents policy setting. Until Encrypted Data Recovery Agents settings are configured and applied through Group Policy, there is no policy and the default recovery agents are used by EFS. However, EFS must use the recovery agents that are listed in the Encrypted Data Recovery Agents Group Policy. If the policy that is applied is empty, there is no recovery agent, and therefore EFS does not operate. Data recovery is important when employees leave the company or lose their private keys. If you ever lose your file encryption certificate and your private key through disk failure or some other reason, the designated recovery agent can recover the data. This is why it's critical to export, save, and archive recovery agent credentials. This also provides the ability for a company to recover an employee's data after he or she has left the company. EFS recovery policy specifies the data recovery agent accounts to be within the scope of the policy (OU, domain, site, local computer). EFS requires an Encrypted Data Recovery Agent policy be defined before it can be used. If none has been chosen, EFS will use a default recovery agent account. Within the scope of a domain, only the Domain Admins group can designate an account as the recovery agent account. Where there is no domain, the local Administrator account is the default data recovery agent. You can configure Encrypted Data Recovery Agents policy to designate alternative recovery agents. For example, you may want to distribute the administrative workload in your organization, so you can designate alternative EFS recovery accounts for categories of computers grouped by organizational units. You might also configure Encrypted Data Recovery Agents settings for portable computers so that they use the same recovery agent certificates when they are connected to the domain and when they are operated as stand-alone computers. In conjunction with the design of a backup strategy, you must create and verify restore procedures to ensure that appropriate personnel are knowledgeable in the concepts and skills that are critical to data recovery. This lesson will share the processes and options available for restoring data using the Backup Utility. An EFS Recovery Agent disables EFS encryption. Once the file is decrypted, the user can open the plaintext file and then re-encrypt the file using a newly issued certificate with the Encrypting File System OID. 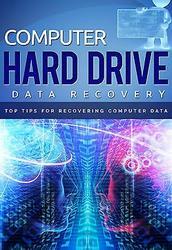 The following sections discuss some of the design decisions an organization faces when choosing between data recovery and key recovery, or a mix of both. To modify the default recovery policy for a domain, you must log on to the first domain controller as an administrator. Then, start the Group Policy MMC through the Active Directory Users and Computers snap-in, right-click the domain whose recovery policy you wish to change, and click Properties. At this point, you click the recovery policy you wish to change and click Edit. In the console tree, click Encrypted Data Recovery Agents. Finally, you right-click the details pane and click the appropriate action you wish to take. We performed nonauthoritative data recovery, which is the default method. Once restarted, this server will be brought up to date with the rest of the domain controllers through the regular Active Directory replication. The other method of data recovery is authoritative, in which you cannot use normal Active Directory replication to update a server after it has been restarted following the restore. For example, if you deleted a container with a group of users, and restored the container with a backup tape from one week ago, as soon as you restarted the computer after the restore, the rest of the domain controllers would bring this server up to date, which would include the lack of the container you are trying to restore. The reason for the authoritative restore is to make the copy of the Active Directory that is stored on the tape the present copy of the Active Directory, not the copy of the Active Directory that is currently being replicated by the active domain controllers. In the Security Settings Public Key Policies Encrypted Data Recovery Agents container implicitly defines the domain recovery policy. Follow these steps to define the domain recovery policy Right-click the Encrypting File System folder in the right-hand pane and choose Add Data Recovery Agent from the pop-up menu, as shown in Figure 27-38, to start the Add Recovery Agent Wizard. The Encrypting File System (EFS) is a technology used by Windows 2000, Windows XP Professional, and Windows Server 2003 to store encrypted files on NTFS partitions. Encrypted files add an extra layer of security to your file system. A user with the proper key can transparently access encrypted files. A user without the proper key is denied access. If the user who encrypted the files is unavailable, you can use the data recovery agent (DRA) to provide the proper key to decrypt folders or files. Tell students to use data recovery when they want to recover data, but not when they want to access the individual private keys of a user. Explain that they should use key recovery when they want to recover data without issuing new certificates. Focus on how private keys are lost. Many students will be unaware that actions, such as deleting a user profile or reinstalling the operating system, will result in the loss of private key material. In this area of the Group Policy Editor, you will see a list of the active certificates for designated recovery agents.You can add to the list of recovery agents in two ways. First, you can select from a list of existing certificates in the directory and add the certificate to the list. To do this, right-click Encrypting File System and select Add Data Recovery Agent. This opens the Add Recovery Agent Wizard, which walks you through the steps of selecting an existing user with an EFS certificate in the directory to add to the list of recovery agents. Second, you can create a new certificate to add to the list. To do this, right-click Encrypting File System and select Create Data Recovery Agent. This creates a new EFS certificate for the logged-in user and makes that user a recovery agent in the domain. If you want to remove a recovery agent, right-click the recovery agent certificate and select Delete. EFS provides for built-in data recovery by enforcing a recovery policy requirement. The requirement is that a recovery policy must be in place before users can encrypt files. The recovery policy provides for a person to be designated as the recovery agent. Again, this is a transparent process. The default recovery policy is automatically put in place when the administrator logs on to the system for the first time (during installation), making the administrator the recovery agent. 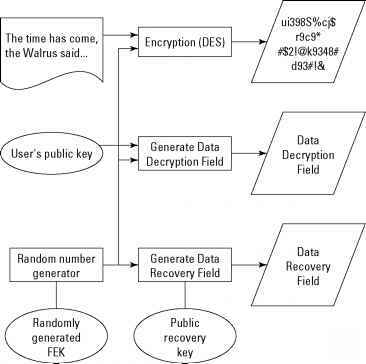 What is the recovery agent Well, the recovery agent is the account that has a special certificate and associated private key that allow data recovery for the scope of influence of the recovery policy. In other words, if you are the recovery agent for the domain, any time someone loses his key or leaves the company without being polite enough to decrypt his files, you will be called on. Files' encryption keys are automatically encrypted by the recovery agent key. In the event of the loss of the user's encrypting key, the recovery agent can decrypt the files. EFS encrypts the bulk of the file with a single symmetric key. The symmetric key is then encrypted twice once with the user's EFS public key to allow decryption, and once with the recovery agent's public key to allow data recovery. No recovery policy When an administrator deletes the recovery policy on the first domain controller, a no recovery policy at the domain level is in effect. Because there is no domain recovery policy, the default local policy on individual computers is used for data recovery. This means that local administrators control the recovery of data on their computers. Through the use of correct backup schedules, Tasha has ensured that the required result is met. Without any other plans in place, she can also recover from start file loss by using the startup disk set and the emergency repair process (she does not need an ERD to do this). In addition, with the startup disks, she can also boot to the Recovery console to stop faulty services from starting. For more information, see the sections Server, System State, and User Data Recovery. Click OK or Cancel to close the Properties dialog. 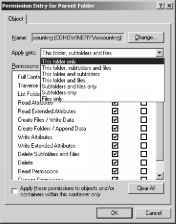 Right-click the Encrypting File System node in the left pane and select Add Data Recovery Agent. This will launch the Add Recovery Agent Wizard. You'll need to provide the username for a user that has a published recovery certificate. You can also browse for .CER files that contain information about the recovery agent you're adding. In addition to the technical changes of the last three years, the business climate has also been transformed dramatically. Waves of power outage problems on the west coast in early 2001 and the east coast in August 2003, and the events of September 11, 2001, have forced businesses to more seriously analyze their disaster recovery and business continuity plans. Hundreds of businesses lost data, and just as importantly, lost access to data for extended periods of time. No longer is it acceptable to simply have a plan for data recovery organizations must also now have a tested plan for business continuity. Fortunately, some of the businesses affected in these crises utilized server-based pomputing, and were able to demonstrate the effectiveness of replicated server-based sites and user access from anywhere, anyplace, at anytime. Common sense tells you not to delete accounts at will. After an account is deleted, you can never get it back. The SID can be tracked, but it can never be resurrected. You have no undelete feature, and the account and SID are lost forever as active objects. If you want to render an account unusable, disable it. 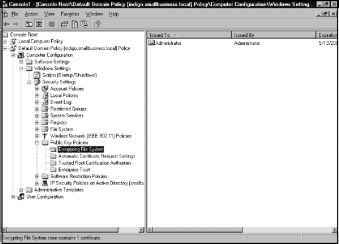 If you are an experienced administrator of Windows NT, this practice is not new to you, and disabling an account in Active Directory is easy. Just select the account in Active Directory Users and Computers and right-click. Choose Disable Account from the pop-up menu. The R switch is used to generate two files, one with a .pfx extension and one with a .cer extension. The .pfx file is used for data recovery and the .cer file includes a self-signed EFS recovery agent certificate. The .cer file (self-signed public key certificate) can then be imported into the local security policy and the .pfx file (private key) can be stored in a secure location. Many security experts debate the issue of exporting private keys. For some, the very fact that you can export a private key is considered a breach of security that weakens trust in the entire PKI system. Others, including myself, argue that you must balance manageability with security. We argue that being able to export a private key can save time and money by enabling the user to move to a new computer or recover files if a private key is lost or corrupt. Multimaster replication provides both failover support and Active Directory protection. A copy of the AD DS database is stored on all domain controllers within a domain, so if one is lost and you do not have access to backup data, you can perform a recovery by reinstalling the domain controller from scratch and replicating the database from other domain controllers . In addition, methods exist for retrieving deleted or tombstoned items in AD DS . Also, you can configure items so they cannot be deleted and monitor attribute changes . All these topics are discussed in Lesson 2, Performing Offline Maintenance. 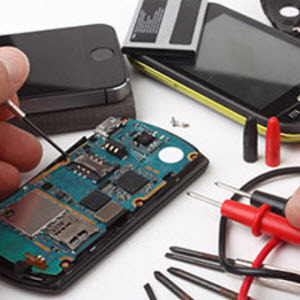 However, these techniques do not always provide the best method for data recovery. For example, objects you restore from tombstone containers do not include all their previous attributes . Whenever a user encrypts a file, EFS automatically generates a bulk symmetric encryption key and then encrypts the file by using the key. EFS then uses the user's public key to encrypt the bulk encryption key. (The user's key is called a File Encryption Key, or FEK.) EFS stores the FEK for an encrypted file within an attribute called the Data Decryption Field (DDF) in the file itself. In addition, EFS also encrypts the bulk encryption key by using the recovery agent's public key. This FEK is stored in the Data Recovery Field (DRF) of the file. The DRF can contain data for multiple recovery agents. Each time EFS saves the file, it generates a new DRF by using the current recovery-agent list, which is based on the recovery policy (explained in the following section). Figure 27-27 shows the encryption process. Although you cannot use Windows Server Backup to recover files from a .bkf format, you can download a version of Windows Backup for Windows Server 2008. It is for use by administrators who need to recover data from backups taken using NTBackup. The downloadable version cannot be used to create additional backups on Windows Server 2008. To download NTBackup for Windows Server 2008 go to http go.microsoft. com fwlink LinkId 82917. Although the file system doesn't care if the file data is on contiguous clusters or spread out across the disk, the fact that data is in different areas of the disk can slow down read write operations. This means it will take longer than usual to open and save files. It also makes it more difficult to recover files in case of serious disk error. Windows Server 2003 provides a tool for defragmenting volumes called the Disk Defragmenter. Note Shadow Copies of Shared Folder provides a way to recursively recover files in a folder. However, this will never delete files, so it will not truly revert a disk to an earlier point in time. It is also not efficient, and Microsoft does not recommend doing it for large quantities of data. If you need to revert an entire disk to a previous point in time, you should restore from a backup medium.